Nomentano is a centrally located residential district populated with many shops and open-air markets. Its most elegant neighborhood is the area between Via Nomentana, Viale del Policlinico, and Via di Villa Massimo, where you will find many fine villas and buildings from the fin de siecle era. Another pretty residential neighborhood is found in the area known as Quartiere di Sant'Ippolito near the crossroads between La Sapienza University and the Tiburtina station. Piazza Bologna (Bologna Square) is also a good residential zone that's conveniently close to Rome's historic centre. 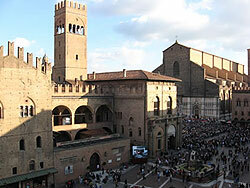 San Lorenzo is a district that is favored by students, as it is close to the main campus of La Sapienza University. These days, it's more than a student district, and has become a fashionable, bohemian district packed with galleries, artisan shops, traditional restaurants, pizzerias, cafes, bars, nightclubs, and a small street market. The Termini station is just a short distance away.